Constant chatter, telephones ringing, colleagues walking up to your desk. Sound familiar? The typical office environment can be a distraction when you’re trying to concentrate. A regular day a week at home can help you to focus and get tasks done. But it’s not just about escaping the noise. Working from home cuts down the time you spend commuting, helps to juggle the demands of home life and boosts your motivation. In fact, a 2015 YouGov poll showed that just under a third of UK office workers are more productive when working remotely. Let’s be realistic though – working from home isn’t suited to everyone. If you thrive around other people, you might not enjoy the solitude of working from home. But if you are happy in your own company, it can be a positive experience. So whether you’re a seasoned home worker, work a regular day a week at home or do the odd day at your dining room table, here are some tips to make the most out of your time. Although commuting to and from work can be tedious, it gives us time to mentally prepare for the day ahead and then switch off again. Wake yourself up with a short walk around the block before sitting down at your desk. Think of the walk as your commute, a chance to get your head in gear. Likewise, when you’ve finished for the day, go out for a short walk to unwind. Yes, the office environment can be distracting but so can your house. Without clear goals, it’s easy to get sidetracked by the television, radio or the cat! Think about what you want to achieve. Perhaps you want to use the time to write the copy for a new leaflet or prepare for a presentation. I save up those tasks that need the most concentration. Plus, I make sure I have at least one thing that I’m excited about doing. I find my most productive days are the ones when I plan out my day hour by hour, giving each task a time slot and ‘deadline’ to make sure I get everything I need to do done. It’s important to create a space where you can concentrate on work, away from any distractions. Make sure you have everything to hand from your laptop to your notebook and pens. Carve out a workspace which is solely dedicated to work only. Preferably that space would have a door or partition of some kind. I use the Nike slogan ‘Just Do It’ as my approach to work: I countdown from five and get on with the task at hand. This is good for tasks you’re putting off. If you find your motivation slipping, reward yourself with a treat. You might say: “I’ll do 30 more minutes of work and then spend five minutes on Twitter”, or “I’ll have a slice of cake once I finish this report”. It’s amazing how a little reward can spur you on. As tempting as it is to hide away at home, it’s important to stay in touch with colleagues – whether that’s by phone, email, Skype or messenger tools. You’ll need to keep each other updated on projects, find out information to help you with your tasks and answer questions from other staff. Tools such as Trello can be particularly useful when working on joint projects, helping everyone to track progress. Leanne Griffin, digital proposition manager at Cancer Research UK, suggests in a recent blog trying out virtual whiteboard tools for team brainstorming and retrospectives – making the point that “working remotely doesn’t have to mean only doing solitary tasks”. The office has a social side to it which you can miss out on at home. 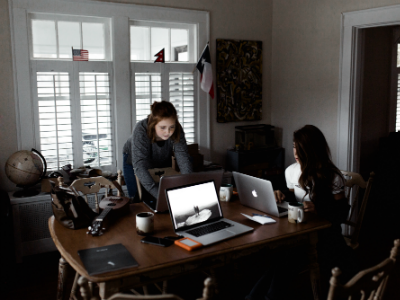 If you regularly work at home – perhaps your charity doesn’t have a workplace or you live a long way from the office – you might want some company now and again. Spend the day in a coworking space, your local library or a cafe. If that’s not for you, switch the radio on at home for background noise. I try to call into the office every day to make sure I stay in touch with the team and because sometimes it can be lonely. My trick is not to use colleagues’ direct dials but to ring the general office number and then have a little chat with whoever answers it. Make sure you have regular downtime. If you struggle to do this, set a reminder to flash up on your screen. Try to also finish work on time. It’s easy to get into the habit of spending the time you would have spent commuting doing extra work. Instead, use it to recharge – see friends, go out for a run or read a book. With no commute it means I can fit things like exercise into my day as well as putting a load of washing on when needed!